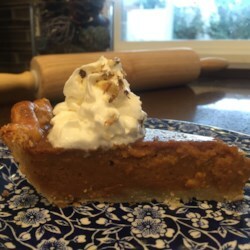 wow,, this pie is sooo creamy and smooth.. just like i remember pumpkin pie.. it tastes just like it, same color, same everything LOL .. mine wasnt that pretty but its really good. changes i made (due to reviewers saying it wasnt enough filling): 1 1/4 cup brown sugar, 1 1/2 cup MASHED butternut squash (about 2 3/4 cup chopped) 1 1/4 cup evaporated milk, 2 medium eggs, 1 tbsp cornstarch, 1/8 teaspoon cloves, 1 tsp cinnamon, 1/4 tsp nutmeg and ginger each. soo good! baked 55 minutes then turned off the oven and left it in there 10 more minutes.. i made this with the butter flaky pie crust from this site!